Manipur Chief Minister N Biren Singh on Monday met the Union Finance Minister Arun Jaitley and senior ministry officials in New Delhi to discuss various issues concerning the State’s finances. In the meeting, the Chief Minister apprised the Ministry of the State’s financial position and health. The meeting was positive with the Finance Minister expressing his understanding of the State’s concerns, an official release stated. Earlier, the Chief Minister had also met officials of the Prime Minister’s Office (PMO) and discussed the developmental needs of the State and the priorities being accorded to various sectors. The PMO officials expressed their satisfaction on the speedy progress achieved against time bound targets of important projects. During the discussions, the Chief Minister requested the Finance Minister and PMO for assistance in taking up more Ima Markets, Thoubal Project, State Guest House, Loktak Livelihood Mission and various other important projects. An amount of about Rs 2600 crore has been recommended for taking up drinking water schemes in the State by the Water Resource Ministry, Ministry of External Affairs (MHA), Ministry of Urban Development and Poverty Alleviation and NITI Ayog. The Finance Minister assured of quick action for recommending assistance from the New Development Bank. 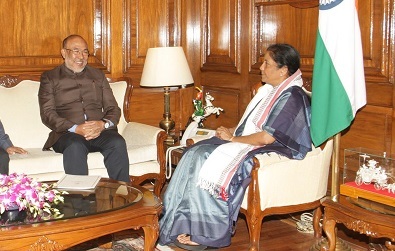 The Chief Minister also met the Union Defence Minister, Nirmala Sitharaman who agreed to attend the Manipur Sangai Festival 2018 as the chief guest of the opening ceremony, the release added.